West Country sailor Pete Goss is preparing to set off on the second leg of a journey sailing from the UK to Australia in a wooden fishing boat. He and his crew of three reached Cape Town in South Africa just before Christmas in their specially-built Cornish lugger, the Spirit of Mystery. 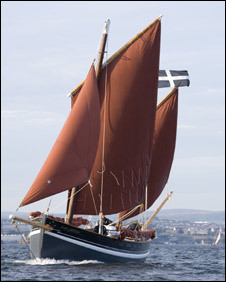 They are due to set off on Tuesday on their sail recreating an 150-year-old trip by a group of Cornishmen. Pete Goss said he and his crew were "ready for it." Mr Goss and his son, Eliot; brother Andy and brother-in-law Mark Maidment set off on 20 October and are retracing a voyage from Cornwall made in 1854. They set off from Newlyn last October. Their vessel is relying on sail and navigating by the stars, like the original sailors did. Pete Goss said the preparing for the next leg had "whetted their appetites" to continue and they were "ready for it". He said: "We've had a good break but the big blue yonder beckons". He added: "I think that we've done everything we can do and all we now have to do is go out see what winds the gods give us." They hope to make it to Australia by the end of February. The trip has been raising money for the charity Mr Goss is patron of, Cornwall Playing for Success, which provides out-of-hours activities for children.